Last year I started a project in which I was trying to figure out, if you start with NOTHING, and spend only $10 a day (and you live in the city and don’t have a garden) can you eat well? In the documentary “Food Inc” there was a family that believed they couldn’t eat well because good food was too expensive, yet they went to a fast food restaurant for supper. I am trying demonstrate that it can be done, that two adults CAN eat well on $10 a day, and likely even less. I used the local Co-op food store and their sales flyer each week for 4 weeks. The food at the co-op here is more expensive than larger grocery chains in the big city, but my point is to be able to shop where you are and still eat well. The food had to be non-processed (you know, not the canned stuff, frozen stuff etc. ), and thus good food. Some was on sale and some wasn’t. Day 1: Eggs, Butter, Pasta (made from white flour, not great but that is what we used for now), Salt. From this you could eat for the day and if you did have some condiments left over from previous purchases of food you could use those to spruce things up. At our food store, this all cost $9.54 cents. At other stores you could get it for less, I’m sure, but that is not part of the project. The point is use what is available. 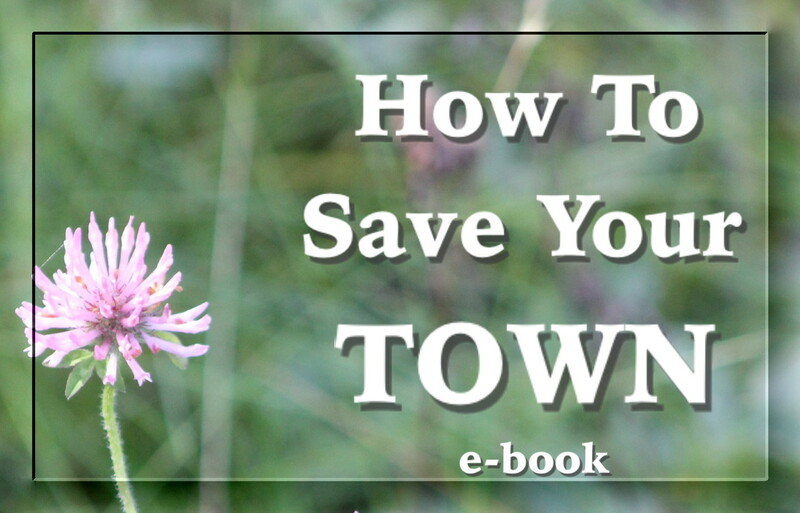 The belief is often that you can’t eat well and cheap, locally. With the ingredients from these two days, I made a vegetable soup that was unbelieveably good. I expect that some people don’t know how to make soup from scratch, and therefore think that they have to buy canned and therefore can’t eat well. We figured out that our soup cost us 38 cents a serving while a store brand, canned, cream of mushroom soup cost about 24 cents. However the nutritional content of the canned soup is clearly lower. One may wonder how this food can sustain you for days but what actually happens is that you build up your stock of food over the week and then weeks, and you are able to continue eating well day after day. Maybe the first day or two isn’t ideal, but when you are considering eating nothing as opposed to this, it looks ok. And fast food costs more. So the point of all this is to, again, show that you can eat well for little money IF you can use your creativity and figure out how to use the food you can purchase. I figure it is often the lack of knowledge in how to cook real food that contributes to eating poorly. Just my thoughts. 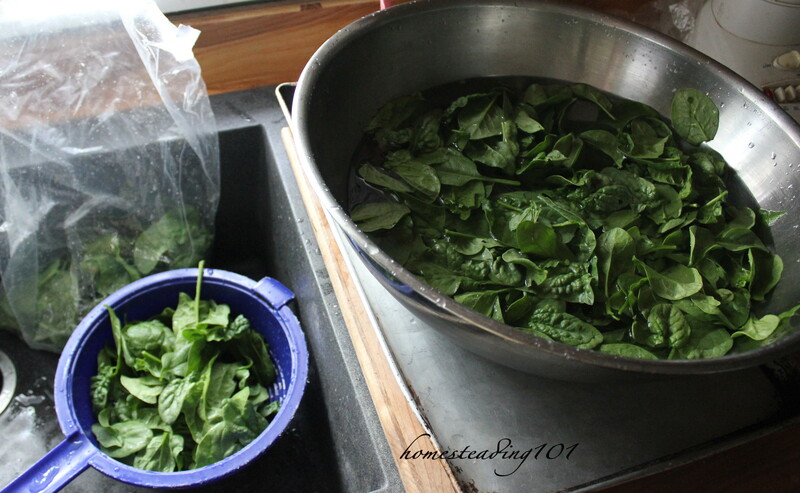 This spring we have harvested our first vegetable – spinach. It seeds itself and we pick it early. Whatever we don’t eat we blanch and freeze for the winter. This year’s spinach harvest was not bad. The amount we get depends where it seeds itself and how much Ernie tills up. Not long ago, our village was put under a boil water advisory due to some maintenance that was happening at the water plant. There wasn’t really much of a risk and Ernie kept on drinking the water from the tap but I decided that it was important to actually go through with boiling, cooling and drinking that water. It is easy to take things for granted. I wanted to actually experience what it was like to have to go through the inconvenience of doing the work to have clean drinkable water. 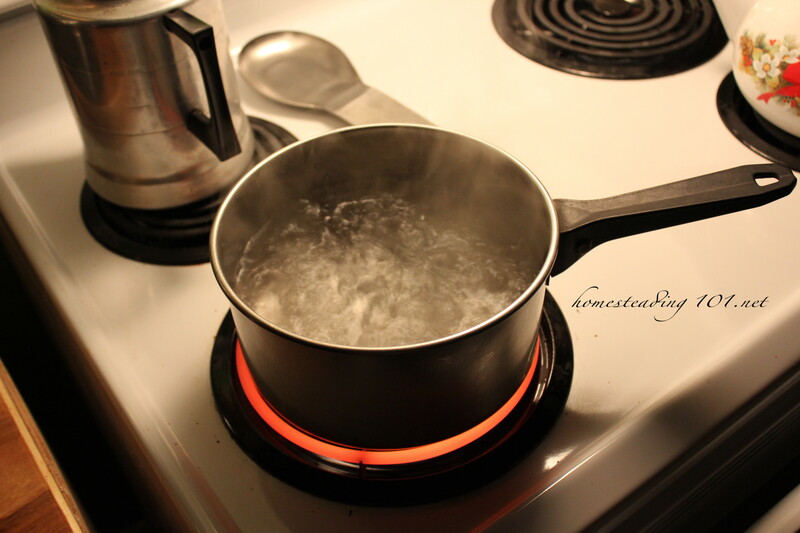 The truth is boiled water tastes awful. But it might be important to try this out for a while just to be prepared for something that happens to thousands of people everyday. Great Vintage Yard Sale Find! 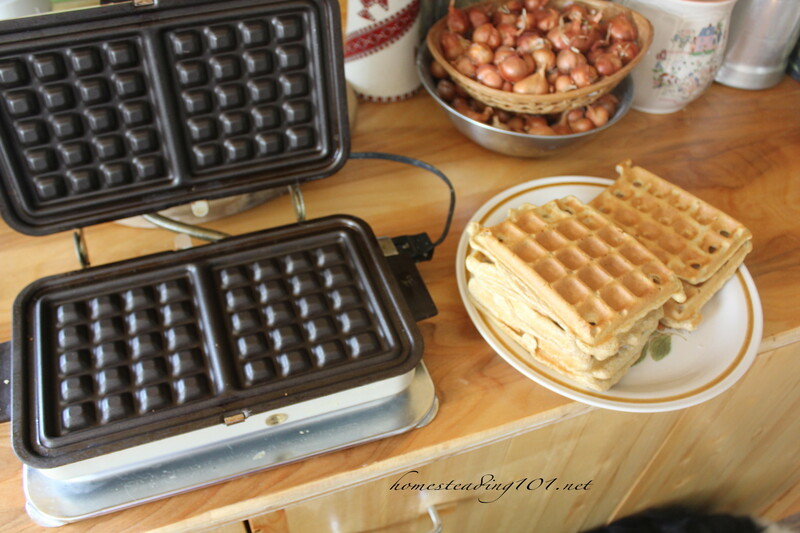 This great waffle maker is decades old and was found by Ernie’s mother at a yard sale ages ago. We use it regularly. Homemade waffles are definitely worth making if you can. Our recipe comes from by baba’s old cookbook from 1958. First whip up the egg whites in a separate bowl. You can do this by hand (takes a bit longer), or by machine. Then whisk flour and BP together really well. Combine milk, egg yolks and fat and mix well. Pour wet mixture into dry and stir until just mixed (don’t over mix). Then FOLD in egg whites. Cook on waffle iron. 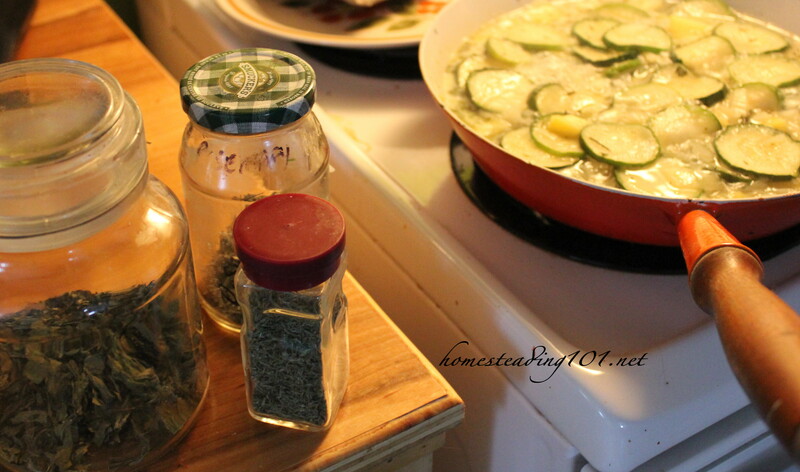 We double this recipe when we make it so we have some to freeze. These waffles are even better when toasted. Eat with butter, maple syrup, fruit, nuts or whatever you like. Believe it or not the following soup is incredibly tasty. I found the recipe in an old cookbook of my aunt’s that she gave me. The flavour comes from the spices and onions. Ingredients: Olive oil – but you can use butter as well. Slice onions and sauté them in the fat until soft. Then add a small amount of rosemary, basil, thyme, and salt. Chop up a medium potato into small pieces and add that. 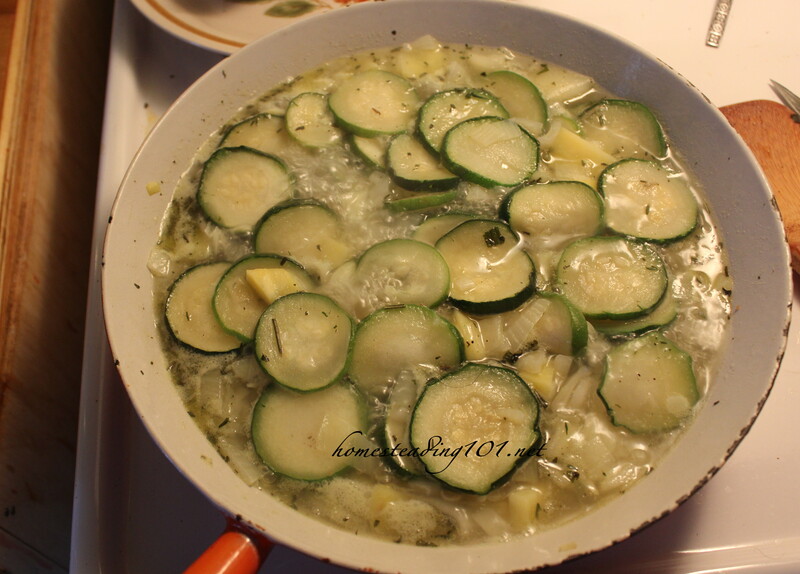 Finally add the zucchini to fill the pan and cook until soft. Taste when cooked to check for spice amounts. Don’t over do the rosemary most importantly. You can add pepper but be careful with it. All of the ingredients in this recipe we grew in our garden except the olive oil and salt, obviously. If you have a small amount of animal fat you that you have saved you can use that instead, as it really doesn’t matter flavour wise. See if you can find the dog hair in the soup picture. We make our own ketchup. It was is easy to do I will never buy any again. The taste is excellent especially with homegrown fried potatoes. Optional: A dash of cloves – I use it because I have some already but I wouldn’t go out and buy any especially for this. Ketchup can be made without it. Be careful how much you use though – it is very potent. Cook the tomatoes well and press them through a sieve to remove the seeds and skins if you haven’t already removed them. 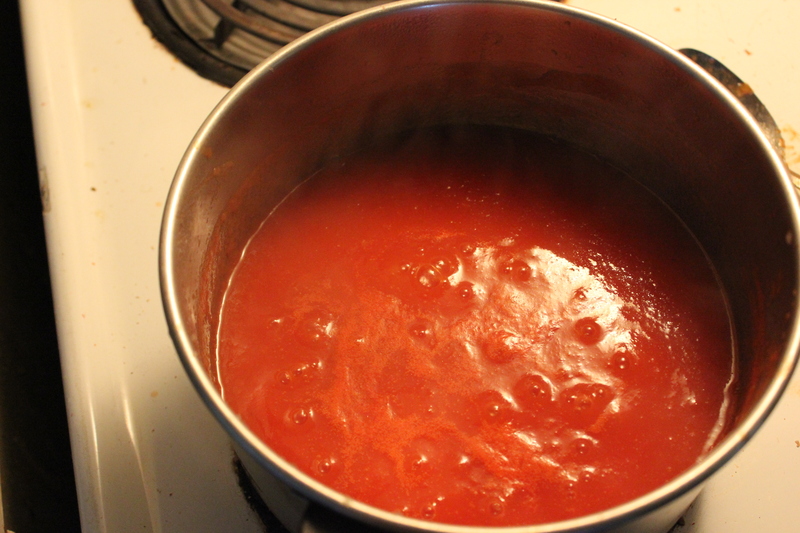 Into the tomatoes add sweetener – lots. Ketchup is very sweet so taste test often as you add this. Add the salt and vinegar. These will be added in less amounts than the sweetener. Add the onions or onion powder. We use small multiplier onions. We add them by grating them on a very fine grater directly into the ketchup. That way you get the full flavour of the onion, but not chunks of it. It blends in nicely. If you use cloves, add it last. Be SSSOOOO careful not to put too much. You only need a small DASH of it. 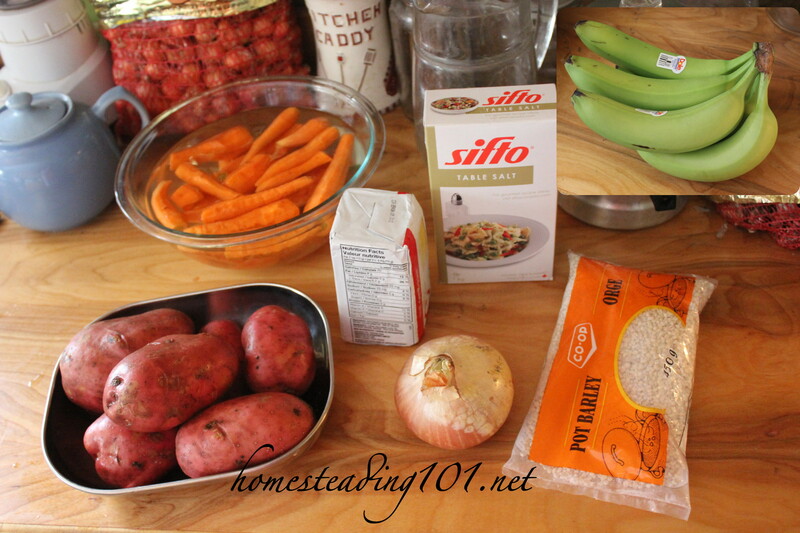 Add these ingredients to taste slowly. You won’t get the full flavour of the ketchup until it cools so this can be a long process. 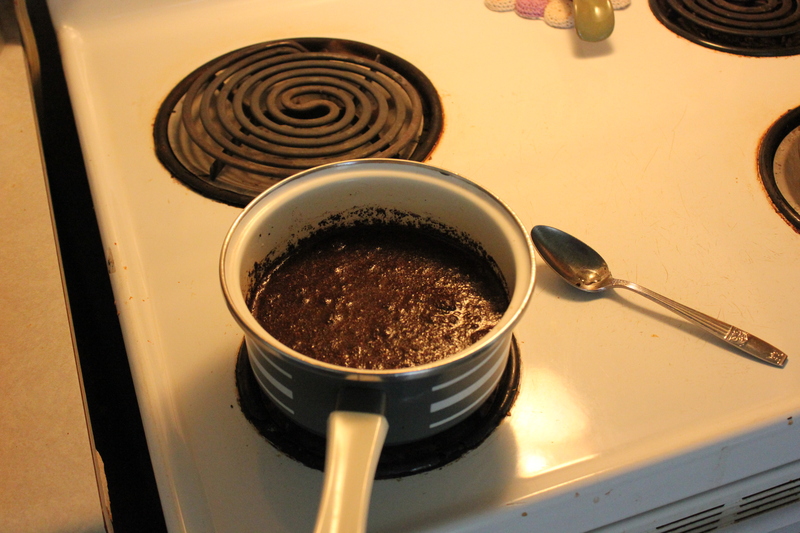 If you like this you may want to try making coffee like our ancestors (settlers) did. In a pot. You don’t need to buy a fancy machine or anything special except coffee. Just don’t boil it too long. One minute at a slight boil is enough. Strain out the coffee grains or don’t, It doesn’t matter. You can figure out what works best for you. The best way to make coffee. Only basic ingredients are needed. Give these things a try and feel the satisfaction of being able to provide more for yourself with less from basic ingredients you grow yourself. 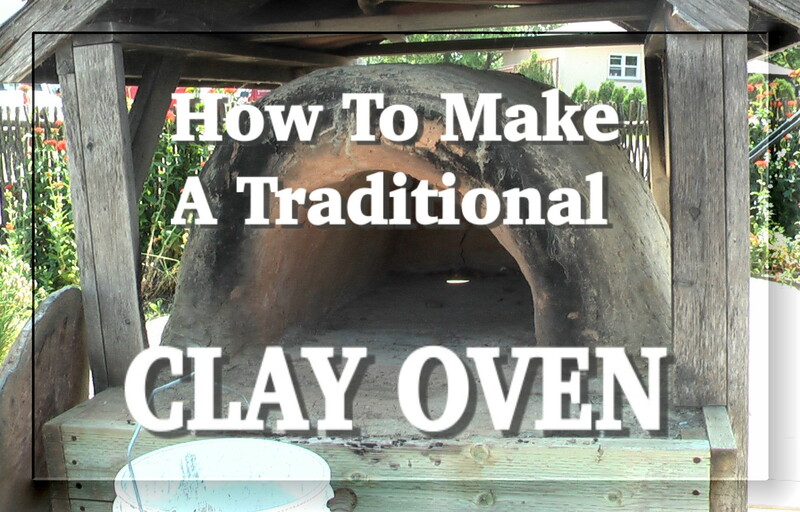 For more homesteading stuff check out our YouTube channel. You can find more of my writing at Medium.